Production of Scottish farmed salmon has risen to its highest level in six years, according to official statistics. The amount produced climbed by 6.9% in 2010 to reach 154,164 tonnes. The value of salmon soared by more than 30% year-on-year to £539.6m, reflecting increases in prices and production. The figures contrasted with those for rainbow trout, which saw production fall by 24% to reach its lowest level for 13 years. The Scottish Fish Farms Annual Production Survey 2010 suggested 1,064 staff were employed directly in salmon production, an increase of 101 compared with 2009. 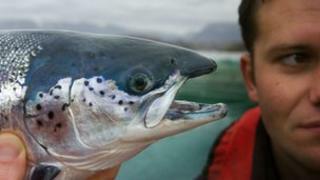 The Scottish Salmon Producers' Organisation (SSPO) welcomed the statistics. Chief executive Scott Landsburgh said: "The third successive annual increase in production, a rise in direct employment by around 7% and the increase in value is great news for the many rural economies reliant on the sector and the Scottish economy as a whole. "With market demand at home and abroad very high, responsibly farmed, superior salmon represents one of the biggest opportunities for sustainable economic growth in Scotland." Commenting on the survey, Environment Minister Stewart Stevenson said: "Scotland is a global player in farmed salmon - the largest in the EU and third in the world alongside Norway and Chile. "I'm pleased that the industry has been able to achieve steady growth in farmed salmon production once again this year, demonstrating that demand for quality Scottish farmed salmon remains very high. Meanwhile, production of rainbow trout fell last year by 1,627 tonnes to reach 5,139 tonnes. The overall number of staff employed in 2010 decreased by nine to 129. The British Trout Association said the fall was in part caused by significant restructuring within the Scottish trout farming sector, which had seen five sites close since the previous survey. Chief executive David Bassett said: "My personal view is that the report is really an official confirmation of what the industry already knew - that structural changes within the sector have had a short-term knock-on impact on production during both 2009 and 2010, which has been exacerbated by two severe winters and fallowing requirements. "Industry expectation is for production to return to previous levels by 2013."